It was déjà vu all over again in June, as Washington's cool and wet weather was eerily reminiscent of last year's cool beginning of the growing season. June featured numerous days of stormy weather, and multiple temperature and rainfall records were set. In arid south central Washington, Station 2 established an all-time (1993 to present) record for daily rainfall on June 4th. The 1.46 inch rainfall surpassed the previous record by 0.22 inches! Day-time temperatures in central and eastern Washington were especially cool last month due to periods of rain, and influxes of cool marine air. High temperatures across the state were 3 to 4 degrees below average, while low temperatures were less cool in a relative sense, and yet still slightly below average. Prosser's average high temperature of 75.3°F was 3.3 degrees below average, while the monthly rainfall of 1.63 inches made this June the second wettest on record. The active weather also included isolated thunderstorms both early and late in the month. Early June weather was particularly wet, especially in eastern Washington. 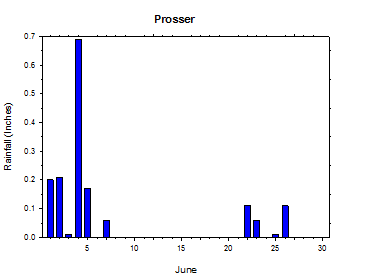 Prosser received 0.7 inches of rain on the 4th, and rain fell on six of the first seven days of the month. Western Washington was also wet in early June, and continued to have periodic rain events throughout the month. The period of the 3rd to the 9th featured well below normal temperatures across the state. 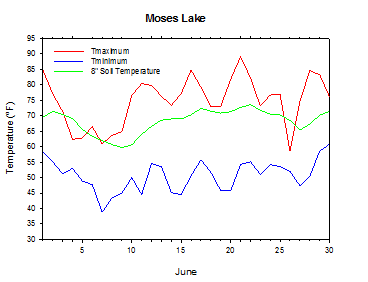 Areas from Moxee to Prosser (WSU IAREC) to Walla Walla experienced 7 consecutive days of temperatures below 70 degrees from June 3rd to 9th. 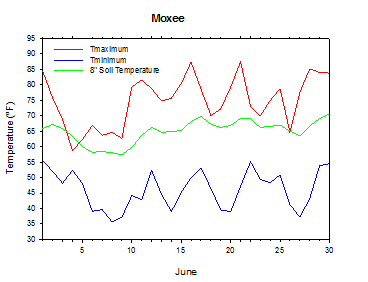 The high temperatures at Moxee and Walla Walla on June 4th were only 58.7°F and 54.7°F, respectively. Cool weather continued on the 7th, as Wenatchee reached a high of only 56°F, and Omak reached only 52°F. 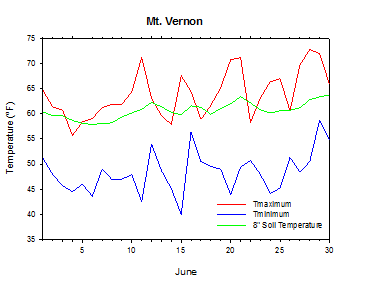 Pullman recorded a chilly low of 34°F on June 7th, while Omak fell to 35°F. Most interesting was that Pullman reached only 48°F on the 9th, which was the second day of the month on which the temperature failed to reach 50°F. Ritzville dropped to 31.7 degrees on the morning of June 15th, which is very late in the year for subfreezing lowland temperatures. The somewhat more seasonal and benign weather that occurred around the middle of the month yielded to more unusual weather by late June. Convective activity associated with unstable southerly flow led to brief but intense rain in parts of Washington on June 23rd. The Nooksack weather station (northeast of Bellingham) recorded a gully washer that dumped a remarkable one-half inch of rain in only fifteen minutes on Saturday, June 23rd. Other AWN locations across the state recorded quick bursts featuring an excess of 0.2 inches of rain during various fifteen minute periods on June 23rd. June 26th was yet another notable day of rainy and cool weather for Washington. A cold upper level low pressure system dropped around one inch of rain across much of eastern Washington, and held high temperatures to the 50s in parts of eastern Washington. Almira and St. Andrews were the cold spots in the state, and reached only 52°F. It was a unique storm for several reasons. It is unusual for such a large area of stratiform rain to occur in June, and even rarer for such an event to affect eastern Washington to a much greater extent than western Washington. The temperatures were as much as 25 to 30 degrees below average for late June. Clearing skies, decreasing winds, and a cool air mass led to a cold morning on the 27th. Broadview (Ellensburg) dropped to 36°F, while Moxee bottomed out at 37°F, and East Olympia reached 38.5°F. Despite a few periods of hot, sunny, and summer-like weather, cool troughs of low pressure moving in from the Pacific allowed cooler than normal temperatures and periodically cloudy conditions to dominate during the month. For most locations, the warmest temperatures observed last month were comparable to those reached in April. 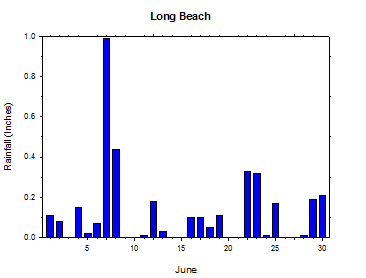 In fact, the heat wave of mid May generally brought warmer temperatures than were observed at any point in June. Following warm weather on June 1st in central Washington, cool and wet weather dominated for most of the early part of the month. On the 4th, heavy rain fell across much of the state, with over one inch recorded in some areas. 1.5 inches of rain fell at Station 2 in south central Washington. Breezy west winds made for a raw and unusually cool June day, as snow fell in the Cascades. Paradoxically, the coastal site at Tokeland was the only AWN location where rain did not fall on Monday, June 4th. Isolated thunderstorms also occurred in parts of eastern Washington. Cloud cover and rain led to cool high temperatures, with some areas in south central Washington failing to reach 60 degrees. Rain continued in many areas on Tuesday morning, as cloud blanketed much of the region. A cold front traversing the state caused a rapid transition to much colder weather in eastern Washington beginning on Monday night. 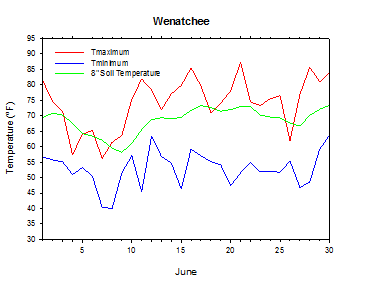 Despite generally breezy conditions, clearing skies and a cold air mass allowed Naches to drop to a chilly 32.8°F on the morning of June 6th. Sunny skies and slightly warmer weather returned to south central WA on June 6th, although the departing low kept clouds and rain going over the northeastern part of the state. More rain came to western Washington on the morning of the 7th, and spread east into the afternoon, as a large and cold upper low moved toward the region. Compared to the system earlier in the week, more rain fell in western Washington and less in eastern areas due to the southwesterly rather than southerly flow associated with the weather system. Despite some clouds and wind, the temperature on the morning of the 8th fell to 33.5°F at Broadview (Ellensburg). A large and cold upper low moved over the area on Friday, June 8th. Cool and cloudy weather on Saturday, especially in the east, gave way to milder weather for the later in the weekend, as more seasonal temperatures returned for the second full week of June. Overall, June began with cool and unsettled weather. High temperatures climbing back into the 70s and 80s on June 10th and 11th heralded a return to more seasonal weather for the mid month time frame. Slightly cooler weather returned on the 13th, before hot weather made a brief appearance on June 16th and 17th. Rain clipped northwestern Washington on the 16th and spread southward through the western part of the state on the 17th. Cooler weather on the 18th and 19th in central Washington was accompanied by clouds and breezy conditions. Overall, mid June was a much drier period than early June, and no rainfall occurred in south central Washington. Warming conditions occurred on the 21st as high pressure built into the region. A closed, upper level low pressure system then moved to a position just west of the Washington coast and led to unstable southerly flow along with showers and isolated thunderstorms across the state from June 22nd to 25th. The storm moved inland on the 26th, delivering wet and cool weather to eastern Washington. Areas from Walla Walla to Huntsville recorded nearly one inch of rain, and Davenport was the big winner with 1.2 inches of rainfall. While rain also fell in central Washington, the heaviest totals occurred east of a line from the Tri-Cities to Moses Lake. Rain-cooled highs in the 50s were commonplace along and north of a line from Ellensburg to Moses Lake to Pullman. Following a cool morning on the 27th, high pressure built into the region for warmer, drier, and more seasonal weather. Although periodic light rainfall occurred in western Washington from the 28th to the 30th, eastern Washington was warmer for the rest of the month. Scattered showers and thunderstorms on the 30th led to isolated brief heavy downpours and unusually high humidity for Washington. 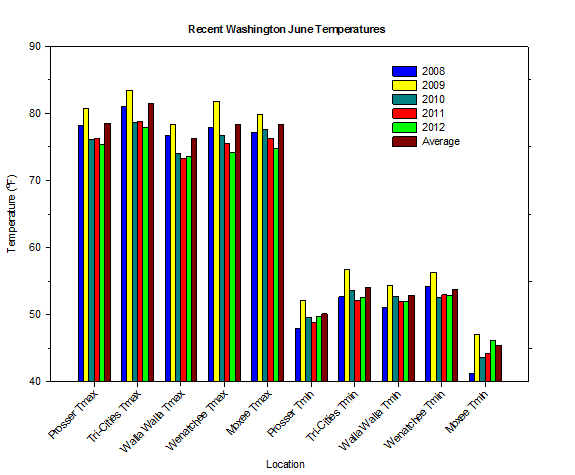 The average June temperature at Prosser (WSU IAREC) was 63.2°F, which is 2.3 degrees (1.1 standard deviations) below average. June was cooler than June of 2011, and was the third coolest on record (1990 to present). The average high temperature was 75.3°F, which is 3.3 degrees below average, and is the coolest value since 2001. The average low was 49.7°F, which is 0.4 degrees below average. The monthly average high temperature was one degree cooler than last year, while the average low temperature was 0.8 degrees warmer. The maximum temperature recorded in June was 88.1 degrees. This is only the second time on record that the temperature failed to reach 89 degrees during June. The coolest daily high temperature was 60.8°F on June 4th. Low temperatures ranged from 64.0°F on June 29th to 39.2°F on June 9th. Daily average temperatures ranged from 73.5°F on June 29th to 53.3°F on June 8th. The monthly rainfall total was 1.63 inches, which is nearly one inch above average, and is much greater than the total of 0.17 inches from last June. 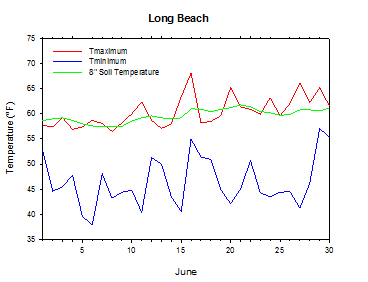 The average wind speed was 4.9 mph, and the average 8 inch soil temperature was 68.5°F. 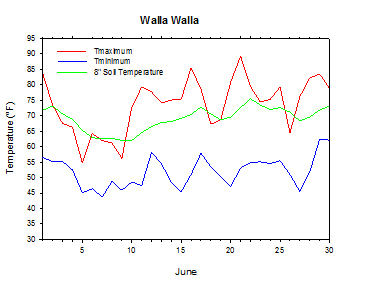 June 4th: The high temperature at Walla Walla was only 54.7 degrees. June 7th: The high temperature at Omak (Pogue Flat) climbed only to 52.3 degrees. 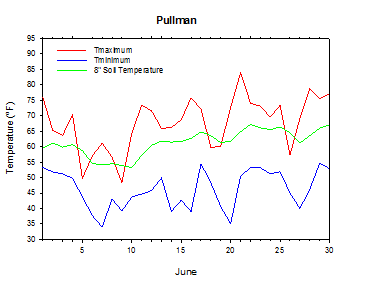 June 7th: The low temperature at Pullman fell to 34 degrees. 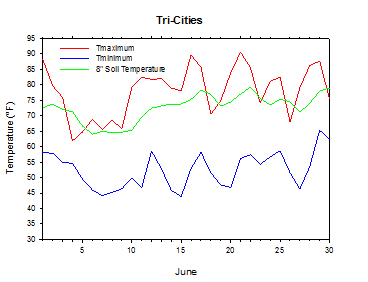 June 15th: The low temperature at Ritzville dropped to a frosty 31.7 degrees. June 22nd: The winds gusted to nearly 52 mph at Chief Joe. June 27th: The low temperature at Broadview (Ellensburg) dropped to a chilly 36 degrees. As of the end of June, winter wheat looked very good, and additional rain helped Washington's grain crops. Cherry harvest continued in the Yakima Valley. Although some rain showers caused cracking on up to 10% of the crop, a large yield was nonetheless expected. Thunderstorms in late June caused hail damage on tree fruits and field crops in areas from Chelan to the Yakima Valley to Walla Walla. The average apple diameter approached 1.75 inches as hand thinning continued. Apricot harvest began at the end of June, while weeding of vegetable crops continued. As of June 24th, winter wheat was being sprayed for rust. Yakima County field corn was knee to waist high, while corn growth was slow in western Washington due to cool temperatures. In western Washington, generally cool and wet weather made for difficult growing and fieldwork conditions in many cases. Christmas tree growers in Thurston County reported aphid infestations in Grand firs, while Pierce County reported good crop conditions. Wet weather caused difficult conditions for hay growers in Kittitas County, although it was good for dryland growers in Benton County. Winter wheat looked good in Lincoln County, and should make for a near to above average crop (National Agricultural Statistics Service). On June 20, 1991, the high temperature at Prosser (WSU IAREC) was only 57 degrees, which is typical of mid March. According to the Climate Prediction Center (CPC), drier than normal conditions are expected in Washington during July. Near normal temperatures are most likely for much of Washington, with slightly enhanced odds of cooler than normal conditions near the coast and warmer than normal temperatures in eastern Washington. The likelihood of drier than normal conditions will decrease later in the summer, and near normal precipitation is expected by the autumn. Warmer than normal conditions are a possibility for areas east of the Cascades during the late summer and early autumn time period.